The somewhat abstract subject of “awkward moments” in film could encompass a wide range of examples; from the ‘special’ hair mousse used by Cameron Diaz in ‘There’s Something About Mary’ to Joe Pesci’s excruciating grilling of Ray Liotta concerning the nature of his comedy in ‘Goodfellas’, to the verbal torture of an elderly shop-owner by the psychopath Anton Chigurh in ‘No Country for Old Men’, you have a veritable cavalcade of cringe-worthy moments in recent film history. However the one “awkward moment” that towers above the rest is not an actual moment. Rather, it is an entire film – and that film is ‘Fight Club’. ‘We’ve all been raised on television to believe that one day we’d all be millionaires, and movie gods, and rock stars. But we won’t. And we’re slowly learning that fact. And we’re very, very pissed off’. 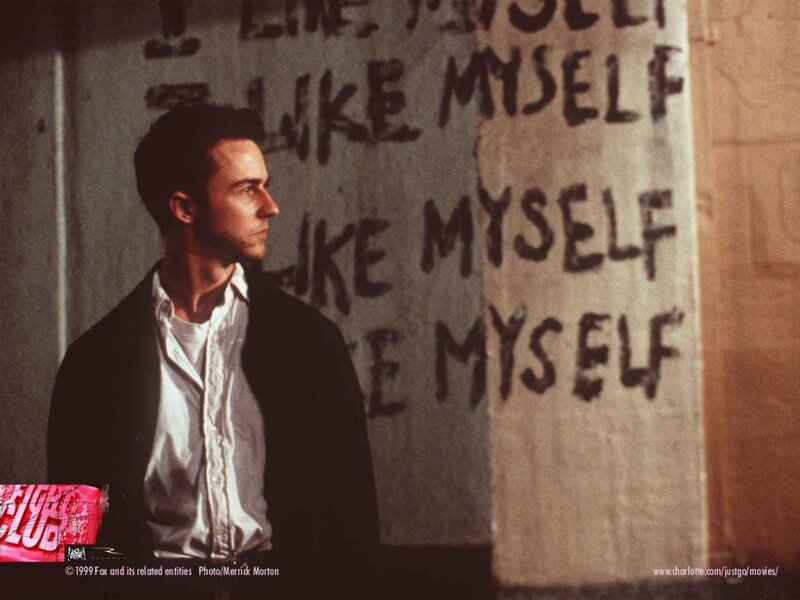 ‘Fight Club’ was a commercial flop and received mixed reviews from critics upon its release; its popularity was gained retroactively via massive DVD sales and a burgeoning cult following. The reason behind its financial failure and its dubious critical reception, where some reviewers accused it of being right wing and malicious, is steeped in an awkward yet tacit admission by viewers and critics alike that the film is attacking the convention of cinema going and the nature of celebrity that feeds it. 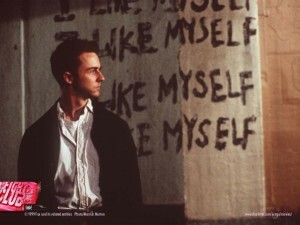 With the exception of Funny Games, and probably some films I am unaware of, Fight Club was the first film, certainly the first mainstream film, to openly question and attack the fantasy land we all enter when we go to the cinema as a microcosm of problems on a social, political and economic scale that exist in Western society. ‘Why are you watching this? !’ ‘Don’t you have better things to do with your time and energy? !’ can easily be interpreted in Tyler Durden’s insidious introspection: ‘We’re consumers. We are by-products of a lifestyle obsession. Murder, crime, poverty, these things don’t concern me. What concerns me are celebrity magazines, television with 500 channels, some guy’s name on my underwear’. To say that this philosophical/political outlook was met with awkwardness or unease by the people watching in the cinema would be an understatement; nobody wants to be told that they are not a superstar, let alone will never become one. The fact that in the 10 or so years that have passed since ‘Fight Club’ the likes of Facebook, Youtube and the X Factor have become household names and institutions that more directly feed this slavish need to feel that we are important ‘snowflakes’ and are on the cusp of stardom merely reinforces the aforementioned theory that Fight Club was an uber-awkward moment for cinema goers in Western society; Facebook is no more a communication tool than Fight Club is right wing. The cusp of stardom is merely their precipice of no surprise.